This is an amazing act of love put together by my friend Rachel Hobson. It’s a list of free and fun things to do in Austin this summer with kids. Check it out. And submit some ideas if you have some at http://austinfamilyfun.wordpress.com/. This is a much needed and valuable resource! This is the brother that needs help. Isaac, fondly called Ike, even more fondly called Ike-a-saurus. He is an adorable, sweet, happy bundle of wonderful. Ike’s mama is the author of Haiku Mama and the amazing blogger behind Haikuoftheday, where you can read a lot of their story in her own words. Ike’s road has not been easy and was born 13 weeks early. 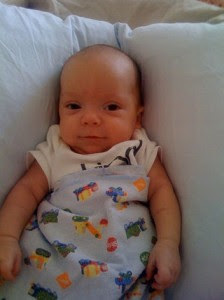 He was a tiny miracle, beating all of the odds to be healthier than anyone imagined possible. But it was still a long, hard, scary road in the NICU. And expensive. Oh, so expensive. But the family was so joyful that he made it to the other side of the hard road behind him, that the money troubles they faced just seemed inconsequential. Finally, Ike got to come home! Hurray! Of course, he could not leave the house, visitors had to be limited, and his health was fragile. Every day felt like an accomplishment. There were many many doctors visits and trips to the ER, adding to the insurmountable medical bills. And THEN, as if this wonderful family had not been through enough, his Dad’s company decided to lay papa off (along with the rest of his department). No severence. Insurance cut off at midnight the same day. Now, sweet baby Ike is back in the hospital. After weeks of doctor and ER visits because of a horrible sound he made while breathing, Ike became very very ill. The family has to focus all of their efforts towards getting him better. If you have a few extra pennies, dollars, stocks or hidden gold bullions that you could put together to send to this family, they would totally appreciate your help. You can donate directly from their Ikeasaurus website. They didn’t want to be “this” family. It’s a tough place. But there they are. And anything we can do to help, will totally go a long way. Here’s Bernadette and I with six of our dearest friends. This picture was taken last weekend on our camping trip. All of these beautiful women are slow family mamas and brilliant creatives as well. If you have a few minutes, grab a cup of tea, kick back and peruse their fabulous websites and blogs. From left to right: Kathie Sever, Bernadette Noll, me, Barbara Frisbie, Shannon Lowry, Liz Garton Scanlon, Lynn Hoare, Sarah Bork Hamilton. I sure do love these lovelies.